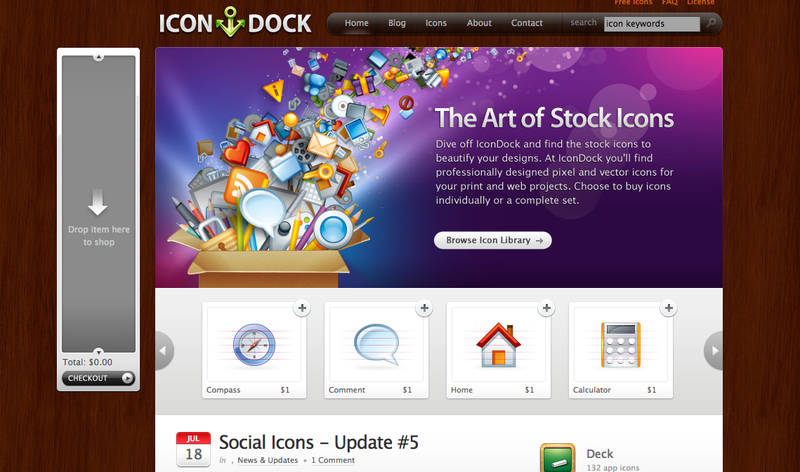 IconDock is an e-commerce site that offers a wide variety of stock icon images for use in your web design projects. They offer the icons for very low prices (most are $1), so it seems like a B2C model in which they focus on a high volume of small transactions rather than trying to sell a lot of icons to one particular web platform in bulk. Design Overview: The site itself is pretty straightforward and it is clear from the start about what it does. In addition to highlighting popular items via large buttons, there is also a visually organized categories list and a stream from their blog that runs down the middle of the page. What’s most interesting to me, though, is their drag-and-drop shopping cart feature on the left-hand side of the site. This seems super intuitive and a great way to make the process of selecting items simple (and maybe even fun). I’m guessing that users might actually enjoy adding new icons to the cart. Other than the nav bar at the top (including search tool), it is really very clean and uncluttered. Audience: Most likely, the audience is comprised of beginner-level design students and people just getting their start in web and graphic design. I don’t think a lot of high-level professionals would use the site, but I could be wrong, as it seems to offer a wide array of options and, if budget is a concern, some very reasonable prices. Site Goals: The site’s primary goal is to sell stock icons, but it also looks like they offer a number of free icons (in a small link at the very top of the page) as a way to introduce new users into the community. I use community loosely, though, as it doesn’t appear to be a top concern for this site, due to the lack of social media connect buttons and the like. Blog: There is, however, a blog, which they use to promote new icon updates and the like. Social Media Integration: I saw almost no social media integration on this site. Even the Contact Us section was a webform. Technologies Used: The entire site is powered by WordPress. There is a blog and an innovative shopping cart feature (described above). There is also a search bar tool and a contact us webform. There is no video or social.